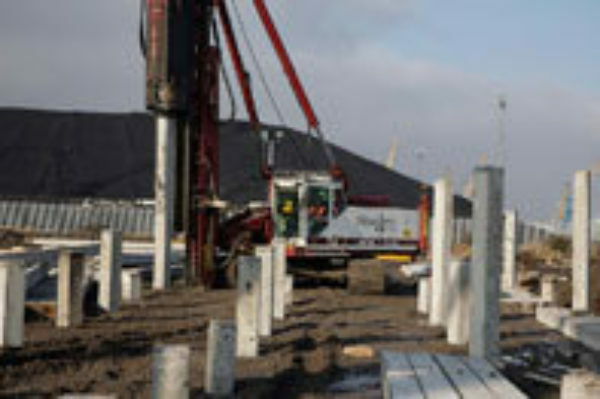 This FK Lowry Piling project addressed a piling solution for a new biomass storage facility. Driven precast concrete piles were used as the preferred foundations for a new portal frame and RC slab to store imported wood fuel pellets. Works entailed the installation of 1515no 270mm2 precast piles for SWL of 1150kN, with various proof and dynamic tests undertaken. The piles ranged from 30·32 metres long, bearing in gravels. The client was specific in the programming of the works as their priority was the installation of the piles for the ring beam supporting the portal frame to enable them to progress this element of the works. Upon completion of this element of the project all three rigs commenced installation of the slab piles inside the ring beam. Each rig installed in excess of 500 linear metres of piles each day so the logistics of delivery (80% from FKL’s plant at Lisburn and 20% cast in Oldham) were most important to the timely success of the project.